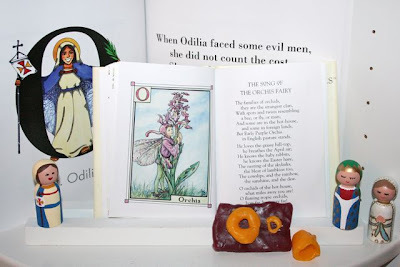 In addition to their Modelling Wax letter O's, the girls also worked on making the letter O using Handwriting Without Tears Hands-On Materials and Kimberlee's Grey Block Paper. Copywork from An Alphabet of Catholic Saints . 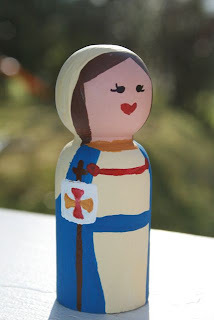 We read A Gift of Gracias, which is about Our Lady of Altagracia. 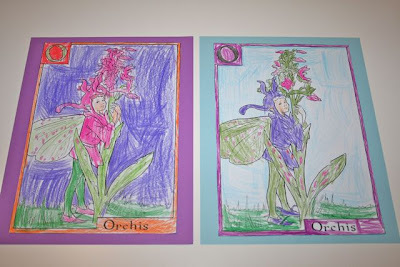 We then discussed the book using the discussion questions in Catholic Mosaic, colored the beautiful picture found in Fenestrae Fidei , and then made homemade Orange Smoothies! 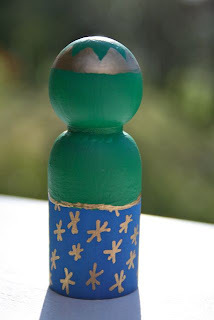 I didn't know until after posting the recipe at Catholic Cuisine, but this particular drink is very popular in the Dominican Republic, where Our Lady of Altagracia appeared, and is called "Morir Soñando!" and talked about "Offering" from God's Alphabet . Break apart 1 graham cracker and use peanut butter to “glue” the four pieces together. Fill the “Treasure Chest” with anything you want. I used raisins and fruit snacks. Drape Mr. Hotdogtopus over the Treasure Chest. Cut a raisin in half and use the sticky side to adhere it to the hotdog for eyes. I found these yummy cookies here. Combine shortening and sugar; beat until creamy. Add egg, vanilla and peanut butter; blend thoroughly. Sift (or just combine) flour, baking powder and salt together. Add to creamed mixture; blend well. 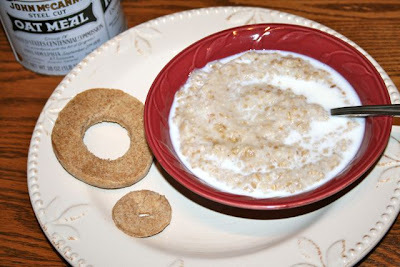 Stir in oatmeal. Divide dough in half. Shape one half to form two rolls, each 8-inches long. Add chocolate to the remaining dough. 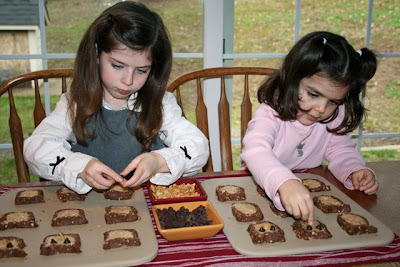 Roll out chocolate dough on waxed paper to form two 8-inch squares. Place one roll on one square of chocolate dough. Wrap chocolate dough around roll; pinch seam together. Repeat for the other roll and square. Wrap in waxed paper; chill for at least 1 hour. Let stand at room temperature for 10 minutes before cutting. 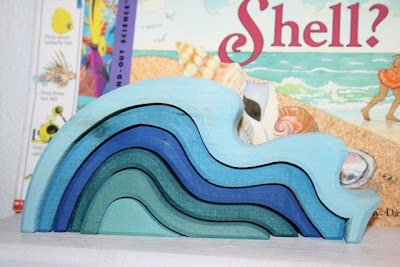 Cut into 1/4 to 1/2 inch slices. 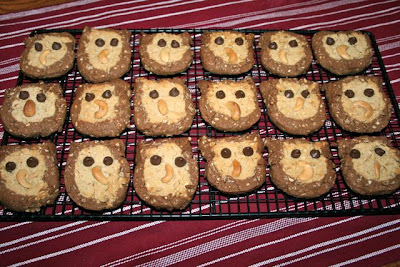 Pinch chocolate dough to form 2 ears for each owl face. Use 2 chocolate chips for eyes and 1 cashew for beak. Place on ungreased cookie sheets. Bake in preheated 350-degree oven for about 12-15 minutes. Don’t stack until the eyes have hardened! "Make any sandwich you would like and then cut the sides off as shown. Take the pieces and flip them backwards to make them fit as shown. Cut a large marshmallow in half for the base of the eyes. Cut a raisin in half for the eyes, and another raisin for the beak." * I was out of Marshmallows, so we used Oreo's (Golden and Mini) instead, which I think turned out even cuter! We also had Oatmeal, Omelets, Cherri-O's, Oranges and Olives! OH! 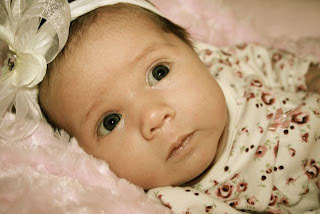 And our little Rose turned One Month Old! LOVE It! Looks like it was a blast! this is one of my favorite weeks of yours. I love the food ideas. little Rose looks beautiful. Your painted saints came out beautifully!!! I hope you linked them to the rest of the painted saints so I can copy them later ;) Your Oreo improvisation on the sandwiches is great! 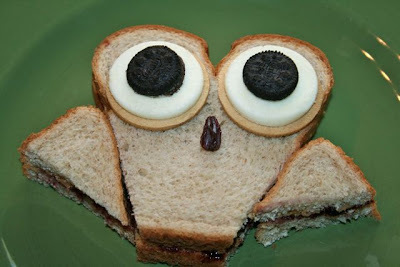 The owl cookies and sandwiches are so cute!! And the octopus hot dog brought back memories for me from when I used to make those for my little brother (except I could only figure out four legs instead of eight!)... 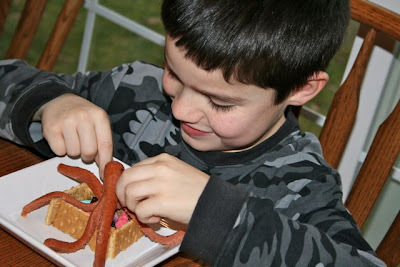 I used to make him hot dogs shaped like canoes, too, and sandwiches shaped like cats... fun times! I love visiting your blog. I get so inspired and get so many ideas. I was wondering all the books you use, are they yours and where do you get them or do you get them from the library. Thanks and God Bless you and your beautiful family. You are *so* very clever!! Also, Rose is one of the most beautiful, precious, and lovely babies I have ever seen! Your pictures are just wonderful. I love the food too, especially the octopus sitting over the treasure chest, hehe. We are going to start our own Alphabet Path after this baby is born, I hope you don't mind if we borrow ideas from you! 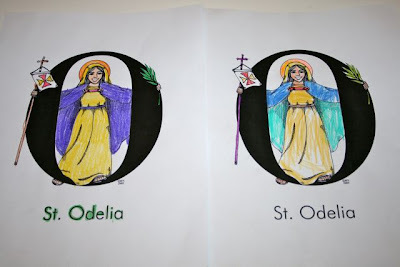 Your St. Odilia and Our Lady of Altagracia are so pretty! What a wonderful collection of saints you are accumulating! Thank you everyone! 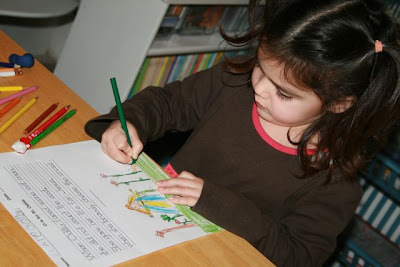 It is really fun to be doing the Alphabet Path again! 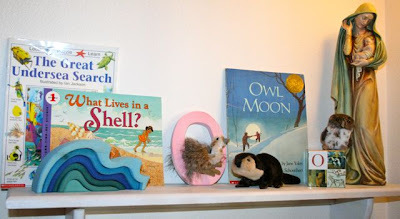 Ana ~ All the books/videos/etc that we used this week were ones we already owned, except for Underwater Counting which was from the library. A while back our libraries closed due to lack of funding, so at that time, I started building quite the large home library, and now, even though our libraries are open again (with limited hours) I still prefer purchasing and pulling books off of our shelves, than borrowing from the library although I am starting to use the library a bit more to preview books to make sure I want to purchase them, when possible. Mel ~ Of course! Most of what I do with my children was borrowed from someone else already. That's the beauty of the internet and blogging, so much inspiration can be found everywhere! How fun to see your Alphabet path up and running again Jessica! 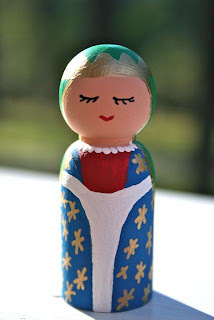 Love your little wooden Saints, all so cute! 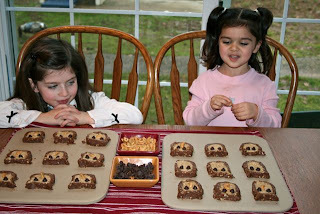 The owl and octopus ideas were fabulous, sharing with my grandbabes (wink). Could you please tell me where I can get a copy to the Coloring Pages from Our Saints Alphabet on CD?? Your link is dead.